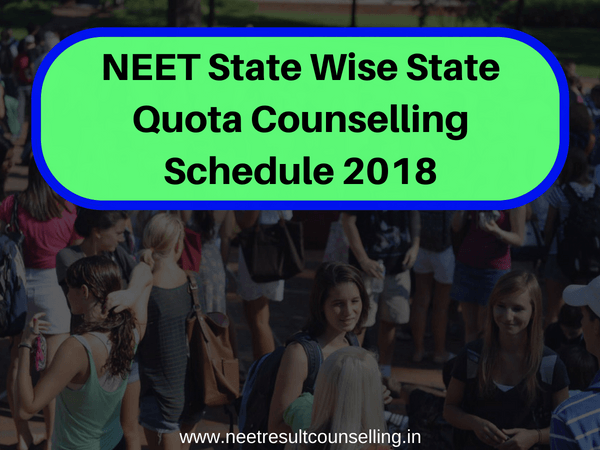 NEET State Wise State Quota Counselling Schedule 2018: After the announcement of NEET UG Result 2018, all successful candidates are now looking for counselling related news. Lots of candidates have no idea about state quota counselling procedure and eligibility. Well, don’t worry guys because we are here to assist you. We are going to provide all information related to NEET State Wise State Quota Counselling 2018. But first of all, you need to know about NEET Counselling 2018. As per the Medical Counselling Committee (MCI), NEET 2018 counselling will be conducted for 15% seats of All India Quota and 85% seats of State Quota. MCI is the official authority to conduct NEET All India Quota counselling. As per the latest news, MCI will publish AIQ counselling schedule 2018 on their official website. NEET AIQ Counselling will be started from 2nd week of June 2018. In order to register in NEET Counselling go through the whole article. The Central Board of Secondary Education (CBSE) is preparing state quota merit list and rank. Lots of candidates were asking us on our Facebook page that how to know NEET state rank and where to register for state quota counselling. Well, as we said, NEET state rank is preparing by CBSE and it will be handed over to the respective states by 10th June 2018. After that, all states will start publishing their NEET state rank. Candidates can check more about official authorities of State quota counselling below. Candidates are advised to keep in touch to know the NEET State Ranks. Here in this article, we are providing all latest notification and news of NEET State Quota Counselling state wise. DADAR AND NAGAR HAVELI The Director of Education 1st Floor, Building No.5, P.W.D. Office Complex, Dadra and Nagar Haveli, Silvassa. HARYANA The Director, Medical Education & Research Haryana Paryatan Bhawan, Bays No.55-58, Sector-2, Panchkula. HIMACHAL PRADESH The Director, Medical Education & Research, Block No.06, SDA Complex, Kusumti, Shimla-171009. KARNATAKA The Executive Director Karnataka Examinations Authority 18th Cross, Sampige Road, Malleshwaram, Bangalore-560 012. LAKSHADWEEP (UT) The Director of Education, Department of Education UT of Lakshadweep. MAHARASHTRA The Director Medical Education & Research, St. Georges Hospital Campus, Govt. Dental College Building, 4th Floor, Near CST Railway Station, Mumbai-400 001. MEGHALAYA The Commissioner & Secretary, Health & Family Welfare, Meghalaya Secretariat, Addl. Building, R.No.315, Shillong-793001, Meghalaya. RAJASTHAN The Secretary (Medical Education), Directorate of Medical Education Govt. Secretariat Building, C-Scheme, Jaipur. UTTRAKHAND The Director General, Directorate of Medical Education, 107, Chander Nagar, Dehradun, Uttrakhand. WEST BENGAL The Chairman, Central Selection Committee, Medical College, 88, College Street, Kolkata-700 073. Sir, i have got 424 marks with the sc-cateogery in neet. which college i can get in all india qouta ???? you will get a good college like madras medical college. This is nice mark.all the best . Sir I got 501 in neet 2018 and I belongs to gen category…my domicile is of UP…which college I will get in UP and in any other state also. I am resident of West Bengal…Nd I belong to SC category…Nd my score in neet 2018 is 317…So. can I get govt.medical college???? Sir I am resident of West Bengal and am of sc category Nd my score in neet 2018 is 317…Can I get gov medical college ????? Do we have to register separately for AIQ & state quota counselling..?